I’ve been hearing a lot of talk about speaking lately. How do you keep their attention? How much should we rely on media? I’m actually teaching a workshop this year at the Atlanta YS National Youth Workers Convention titled, “Using 10-Minute Talks,” a seminar that encourages youth workers to keep their talks short and story centered, like all the talks I provide in my book, 10-Minute Talks. This month I even wrote a 5-blog series title, “Communicating with Clarity,” outlining some of the key principles I’ve learned over the years speaking professionally. 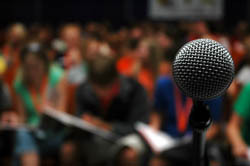 I like the article because the author, Amber Mac, speaks to those of us who might have once had fears of talking in front of audiences, and provides three simple tips to help us make our presentations really pop! In her first point, she gives us a clear recipe for using creative audio, video and pictures in our presentation. This is great advice for those of us looking for a little spice in our presentation. I agree with her wholeheartedly that many people use “dry and boring” PowerPoint slides. I sometimes wonder why people even use PowerPoint when it is only an outline of their talk. I always use videos, pictures and fun facts in my training workshops. I even use my own creative background—never wanting to have that same ol’ “template” that came with the program that my audience might have seen somewhere else last week. Amber also pounded the point of using stories. Music to my ears. I really enjoyed her article. I encourage you to check out the entire article HERE. Which of Amber’s three methods have you found success with? What other methods have you used? Time Out: Who is your audience?